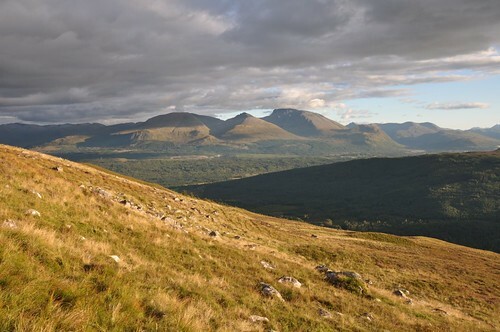 My original plan for these two hills lying to the north of Glen Loy was a circular walk with a camp on Meall a’ Phubuill after climbing Beinn Bhan. 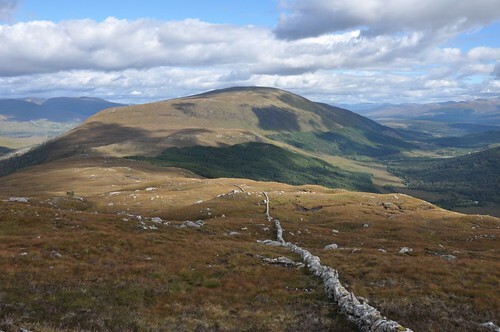 As it was I had a meeting arranged with my friend John for the following day to climb Beinn a’ Bheither so decided to tackle both hills as a day walk. 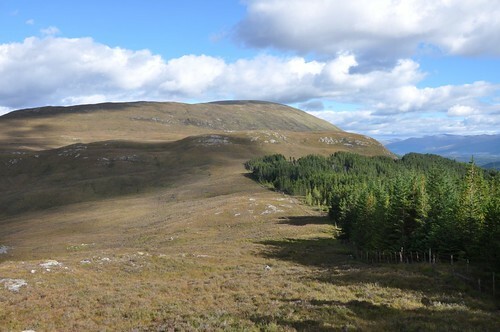 After an overnight stop at the fine Bunroy campsite at Roybridge I headed along to Spean bridge to pick up a map and some supplies for lunch. 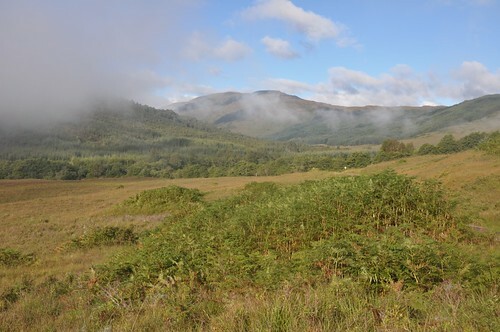 The sun was shining and it looked a very promising day but as I headed over to Gairlochy I was engulfed by fog which persisted as I turned into Glen Loy. After parking just over the bridge outside the gates of the lodges at Inverskilavulin I headed west along the tarmac. 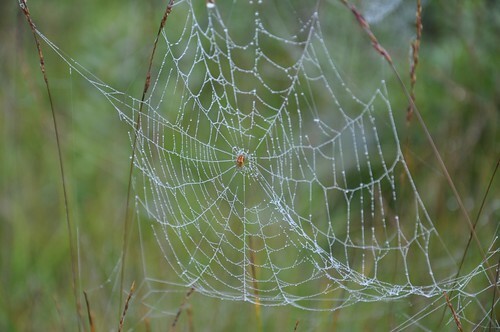 There were plenty of spiders webs on show glistening in the dampness of the morning mist. 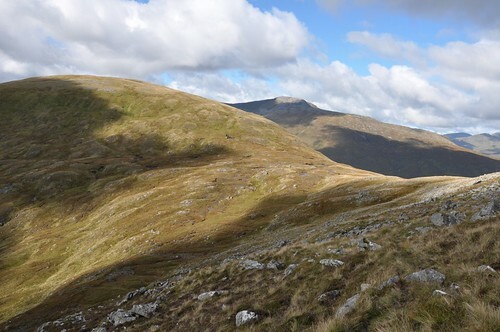 Fortunately though it wasn’t too long before the sun started burning off the grey shroud and the blue skies above started to brighten the green slopes of Stob an Ghrianain and its impressive northern corries. A couple of cars had passed me by as made my way to Achnanellan, were I found them parked. An older couple looked like they were readying themselves for a bit of bird watching whilst a group of three guys prepared themselves for the hills. Having passed through the landscaped grounds of the main house I took to a stony track along the north bank of the river Loy. 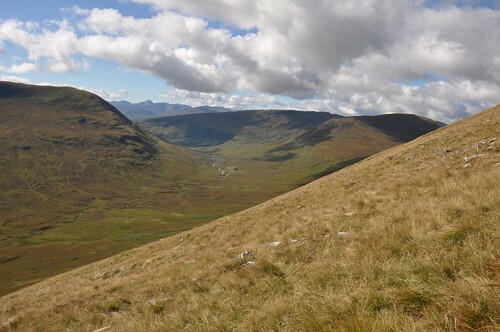 After passing the woods of Brian Choille the way evolved into a path which I followed for a short while before beginning a rising traverse over the grassy hillside. Crossing the slopes of Braigh na Brian Choille my way turned above Coire nan Laogh and between some crags to reach the bealach below Meall a’ Phubuill. 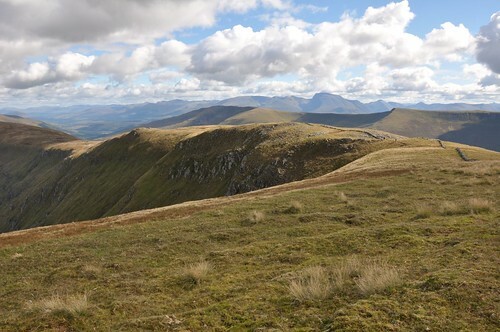 Some good views west along Glean Suileag were interrupted as the impressive sight of Gulvain’s upper reaches began to dominate the view across Glenn Mallie. 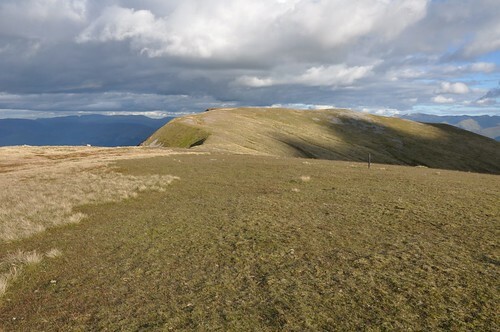 A short climb up grassy slopes soon lead to the flat summit area, a fine place to pitch a tent! I savoured the views over lunch, taking care to take my sandwiches with me as I strolled around the top to avoid them being stolen by a large flock of crows lurking nearby. The other three guys eventually appeared and we enjoyed a chat before they headed back to the bealach to recover their rucksacks. I soon followed, albeit reluctantly as I was enjoying the warm sunshine and pleasant surrounds. 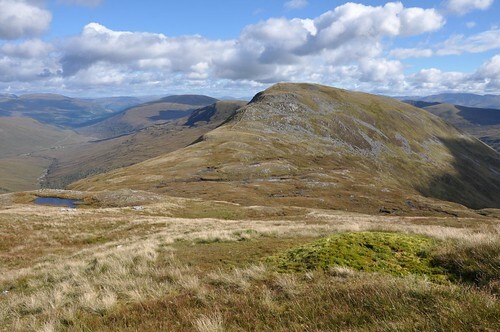 Another short climb was required from the bealach following a wall to reach the point 747 and the start of a fine ridge walk along Druim Gleann Laoigh. I passed my fellow walkers about halfway along the ridge were they had stopped for a sandwich. 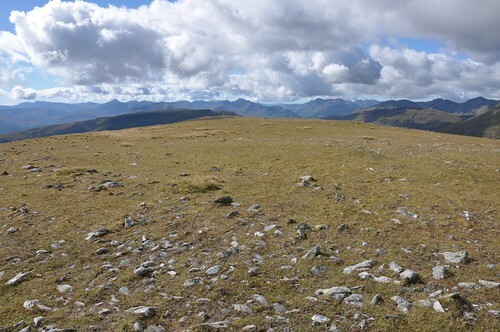 The ridge maintains a good height on the way to Beinn Bhan but eventually drops off after about 3km onto 2km of pretty testing ground. 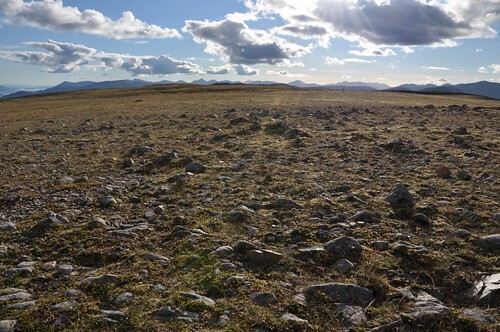 A good mixture of marsh, bog and peaty ground provide a rough crossing over Am Mam and onto the grassy north west shoulder of Beinn Bhan. 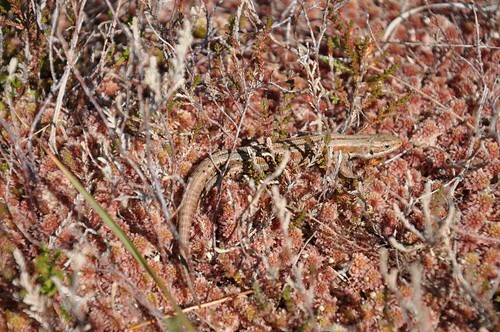 A common lizard scuttled along over some bare ground making for cover in the longer grass. It was a steady plod from here up somewhat spongy but much drier ground than I had just crossed. 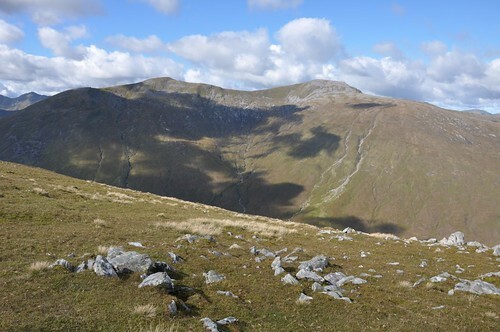 Eventually the west top was gained before a nice high level stroll around the edge of Coire Mhuilinn was required to reach the rather stony summit area, the top situated at the far north east corner. The cloud had been building and it felt rather cool in the shade but soon warmed as the sun reappeared. 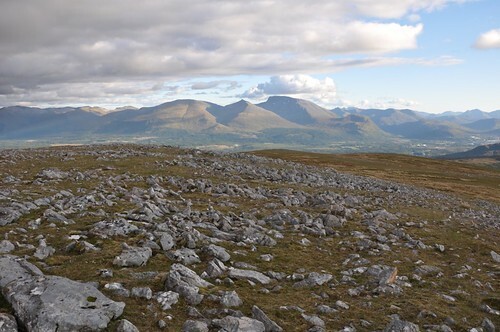 Beinn Bhan is a fine viewpoint for Beinn Nevis and the Grey Corries and they provided plenty of interest during the steep descent back to Inverskilavulin. There was a lot of bracken on the lower slopes which made the last section a little awkward. The lodges at the bottom were fenced in but I eventually found a gate allowing access to the drive near the entrance were I had parked. 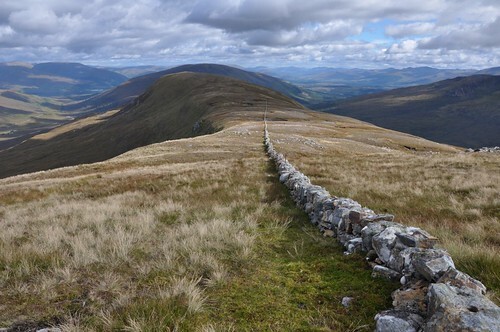 Although tough going linking the two, on the whole it had been a fine and enjoyable outing.